← RIP: The Last Karaite Shochetet? I dedicated the talk to the life and achievements of Madame Rachel (Sheila) Cohen. She attended the Karaite synagogue every Shabbat in her 80s (!!) and explained the weekly Torah portion. You can see a short clip of her at the end of the video. One could write volumes on any of the individual topics in the presentation, but since I only had 25 minutes I did not go into a deep justification/explanation of the Karaite or Rabbanite theology on these issues. 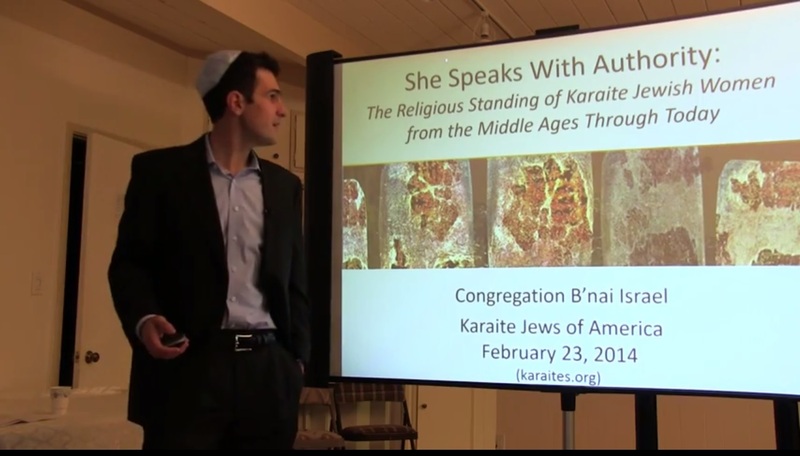 And since it is Women’s History Month, if you think that Judaism can learn from the Karaite approach to these issues, by all means share the video with friends. People often ask me for a bibliography (of sorts) in case they want to do some Karaite reading/learning on their own. Here are the references to the Karaite-focused works I discussed. There IS a Meḥiṣah in all Qaraite synagogues where females do not worship on a higher level, like in Yerushalayim. You ought to correct this mistake. Hi Zvi, thank you. I will look into this. (I based my statement on the words of Hakham Rashi Moshe Firrouz, who says that there is no such requirement.) I also do not think I said there were no separation barriers in any synagogue, but I will definitely be mindful of this and I always appreciate your pointing these things out to me. OK Shawn, I was referring to the table where you had written “Mechitza NO”. I thought you would perceive this. I have not sought to cause you or someone else aggravations. BTW, I harshly rebuked R. Moshe Firrouz for stating in his own presentation that there are no chairs in Qaraite synagogues, when there is nothing easier than stating “in Qaraite synagogues there are some chairs only near the rear wall”. For the life of me I cannot fathom why many Qaraites repeat the untrue claim that no chairs exist in Qaraite synagogues, as if the truth is of this detail is somehow contemptible. Hi just found out that my Family tree originated from the Karaite Jews . I googled information on and found your talk . I found it very interesting and can see from my family the charastics through the generations to be the same as the Karaite Jews . my Name is Niamh Reynor and want to learn more about my ancestors . I myself was born in Ireland and I believe we were descendants of Karaite Jews in France who were being persecuted .